One of the most interesting questions we get by those who are learning about aquaponics relates to how we can possibly grow food without using soil. Because aquaponics takes advantage of nutrient rich water recirculating through the system, plants can be rooted in an inert or soil-less media, and can readily take up all the nutrients they need from the water that passes by their roots. Since the plants don’t have to spend lots of energy pushing root tips through heavy soils, endlessly searching for essential nutrients, they can grow much more efficiently (i.e. faster) in aquaponics, despite having no soil. So what exactly would they be grown in again? 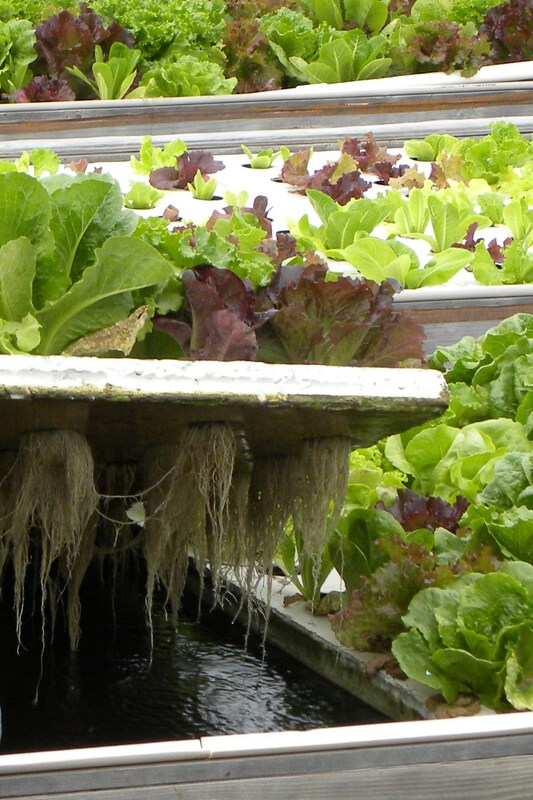 There are two main schools of thought for aquaponics growing media. The first is basically a gravel bed and the second uses a floating raft with holes where plants can send their roots into the water below. Each method has it’s advantages so we’ll talk about both. A media bed uses gravel or similar material which provides enough structure for it to set down roots to have a stable plant but also has good spaces between the rocks for air and water movement. For this, gravels which are 1/2″ – 3/4″ work great, not too small like sand where there is little space for air, but not so big that the seeds you’ll plant fall deep between the gravel. Many people, including us, use a formed type of expanded clay called hydroton or hygromite which is lightweight, easy to work with, and provides a nearly ideal balance between stability for the plant and air space. 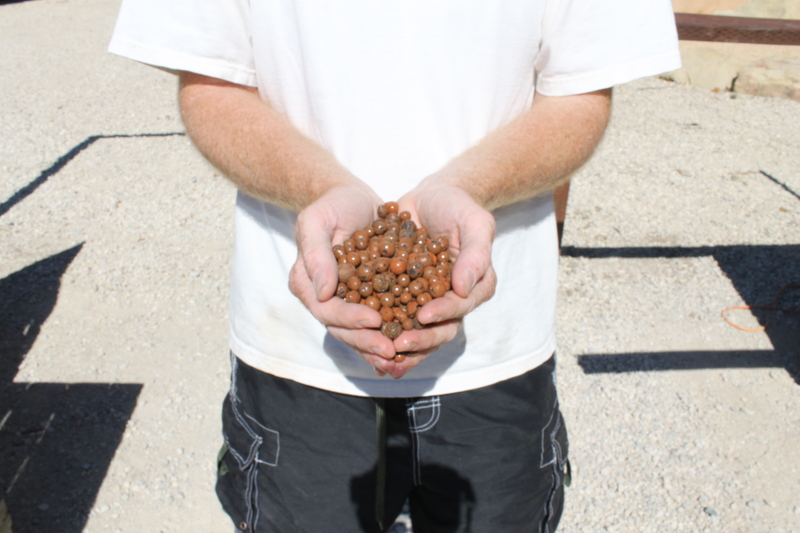 Most hydroponic stores would carry these ‘clay balls’ and while they are initially expensive, they last a long time and save your hands from the abuse of digging through sharp, heavy gravel. Proper media beds are designed to flood and drain so the root systems don’t get too waterlogged and starved of oxygen, leading to root diseases. This is done by having a water pump on a timer or in a more sophisticated way, using a device called a ‘bell siphon’, a siphon which automatically starts and breaks, letting you flood and drain your media bed on a regular basis, all without any moving parts besides your water pump! There is a lot of information about bell siphons online, how to build them, what materials to use, etc. Just know, you’ll have to balance the flow rate being pumped in with the size of the outlet on the bell siphon; too much water pumped in and the siphon will never stop, too little and the siphon will never start. Try to size it the best you can and use a ball valve on your pump so you can make small adjustments as needed. Contact us if you have any questions; Randy has year’s of experience building and operating bell siphons, even creating waves within coral reef aquariums! A raft system typically uses thick styrofoam sheets floating on a body of water. Holes are drilled through the styrofoam with plants placed in small net pots in the holes so their roots can grow down and into the water column, where they are bathed in nutrient rich water. A small amount of inert media is placed in each net pot to allow the plant to set roots but it is the roots descending into the water which gives this method it’s big advantage. To be clear, most people use another type of media in net pots, coconut coir, or husks. These long fibers from the coconut shell were formerly a waste product but not provide a good planting medium for net pots. This wicks some water up into the net pot and allows the roots to easily penetrate through into the water. Raft systems must have two things to keep the plants from drowning though; they must be high enough above the water that the top is fairly dry and the water must have high oxygen levels so the roots can breathe. Rafts are easy to work with, can be drilled out to whatever spacing your plants need, but don’t provide a lot of support for taller or heavy plants. For these plants which need lots of support, such as tomatoes, cucumbers, squash, or even corn, media beds are generally better than rafts. For many of the leafy greens and smaller flowering plants, rafts provide all the support they need. Which type is best? Well that is up to you and what you want to grow. Since your aquaponics system is an ecosystem, you’ll be growing much more than just fish and plants. Both methods have a large amount of surface area for nutrient processing bacteria to grow, which is crucial to a stable aquaponics ecosystem. Well designed media beds with a regular flood and drain cycle can also host earthworms to help break down solid fish waste into a soluble and sought after plant super food. Small invertebrates such as gamarrus shrimp can also do this same function in raft systems as well but are more difficult to obtain than the ubiquitous earthworm. As we learn more about the benefits of both methods, many feel that a combination of the two growing methods offers some of the best of both worlds and lets you easily grow a variety of crops and have a healthy and stable aquaponics system. What a great aquaponic system. I really love to see floating lettuces. « Newsletter Archives – New!